Good comes from everything: Best GF Graham Crackers! Good News: Bad News, or as it’s called at one of the camps Gus has worked as a counselor: “Rose, Thorn, Bud.” The kids go around the end-of-day circle, reporting on the best thing of the day, the worst thing, and that to which they’re most looking forward. It seems right that one should end on an optimistic note, so first my bad news. It has to do with the cheesecake I was inspired to make after listening to a pre-Valentine’s Day NPR interview with Nigella Lawson who is promoting her new cook book Nigellissima. The recipe includes a graham cracker crust. Because I was pressed for time, I purchased pre-made “graham crackers” at Hannaford Brothers, a market that has been committed to stocking a wide variety of GF foods. Thorn: Kinnikinnick (www.kinnikinnick.com), a reliable Canadian gluten-free food company that makes the first bagels we thought came remotely close to conventional ones, offers a “graham cracker” like product called S’moreables. Because the quality of what is readily available has improved dramatically in the 14 years we’ve been practicing a GF diet, there is no excuse for S’moreables. The urine colored packaging and prescriptive look and feel of the cookie should have been fair warning about the texture and taste. On a scale of 1 – 10? One. I couldn’t plan to use enough butter, sugar, and cinnamon to remediate them. Rose: Determined to make the cheesecake, I carved out the time to bake graham crackers. The original basis for GGFB Co. was our cookies. While we will offer those recipes, we have other ideas about how to do it. The S’Moreables experience demonstrated an emergent need to alter the plan. And so, the recipe for GF Graham Crackers; you may never go back to conventional ones, even if you can! Second Rose: The Hannaford Customer Service gal graciously accepted the return of the opened S’moreables package and refunded the purchase price. I’ll fill out a comment card. Fingers crossed the Health/GF food buyer will take note. 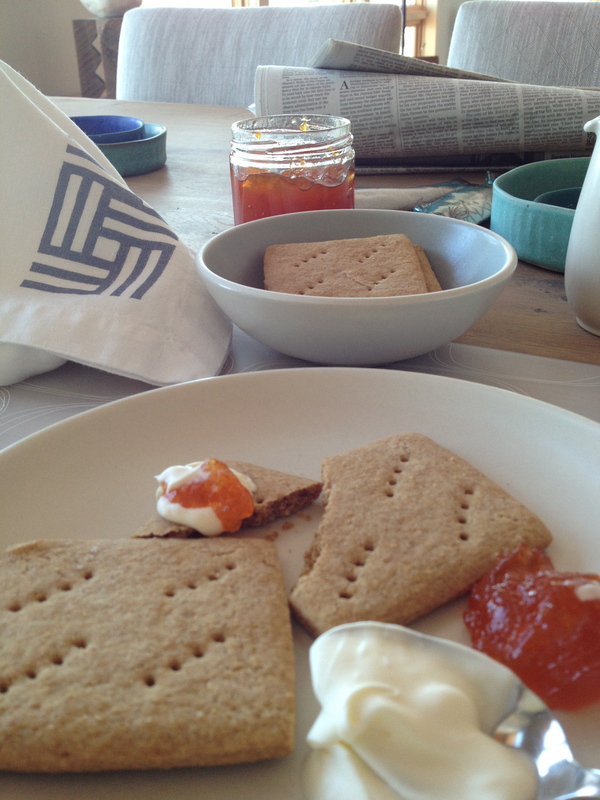 Bud: I’m delighted to share our recipe for homemade “graham” crackers and hope you’ll make them often for pie crusts, campfire S’Mores, or as pictured at the end of the recipe, to eat with creme fraiche, your favorite jam, and a cup of strong coffee. They are a uniquely simple pleasure and one of my favorite cookies. Enjoy! P.S. The recipe for Nigella Lawson’s Cheesecake with GF “Graham” Cracker Crust will follow in a day or so…. 1. Combine the dry ingredients in the bowl of a stand mixer. Mix on low speed to blend. 2. Using a coarse grater, shred the butter over the dry ingredients and mix on low to coat. 3. In a small bowl or small glass measuring cup, combine the water, honey, molasses, and vanilla. Add to the dry ingredients and mix on medium low to form a dough. If it doesn’t come together add a little more iced water one teaspoon at a time until the dough forms a nice ball. 4. Form the ball into a disk, wrap in plastic wrap, and refrigerate for at least an hour. 5. Heat the oven to 325 F and line two cookie sheets with parchment paper. 7. Bake for 15 minutes or until golden brown, rotating the cookie sheets half way through the cooking time. Turn off the oven, open it slightly for a few minutes to reduce the heat, then close the oven and let the cookies rest in the warm oven for 10-15 more minutes or until cool. This will ensure crispy graham crackers. Optional: sprinkle cinnamon sugar over the the cookies before baking. Tags: Best GF Graham Crackers, Gluten free graham crackers, homemade GF graham crackers. Bookmark the permalink. Previous post ← Blum’s Famous Coffee Crunch Cake made GF! Prepare to be amazed! Although I don’t practice a gluten-free lifestyle, a good friend does. When I make cheesecake for him, I use a shortbread like crust, similar to the crust used in lemon squares. I substitute rice flour with very good results. So good that anyone I have served it to, can’t believe there is no flour. Your graham crackers look fantastic! Sounds like a business opportunity! mmmm…don’t you wish they would invent being able to transfer smell on the web. I can just imagine the lovely smell while those are baking!!! They look awesome! Yum! I’ve been wanting to make a gluten free key-lime pie. My friends in Australia have never had it, but my partner is gluten sensitive and lactose intolerant (so I will be using coconut milk instead of milk) and I will definitely be using this GF recipe for the crust! Thanks for the recipe! These sound great. I’ve never tried to bake anything like this before. You ‘liked’ my spiced Valentine biscuits, but they’re not gluten free, I’ll post my favourite recipe for spiced gluten-free madeleines which I make for my coeliac mother-in-law, just for all the GF cooks! I cannot wait to try these. I have kinnikinik (sp) s’moreables in my cupboard. I figured that was the best I was going to get. Yipee! Making graham crackers from scratch is going to be one of the nicest things you do for yourself, friends, and family. You and they are worth the extra time and effort. Good luck and enjoy!